Another year, another trip to Mt. 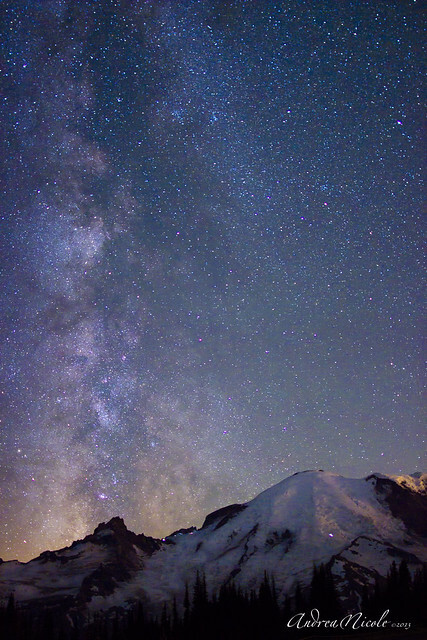 Rainier for the now annual shot of the Milky Way with a couple of obligatory Perseid meteors. Last year, I posted about how to obtain shots of the Milky Way with the bare minimum in terms of equipment — pretty much any DSLR, and the run-of-the-mill stock lens (18-55mm f3.5). That tutorial can be found here. Not a great setup for some galaxy shots, but if it’s all you have and you get the settings right, you can still get some pretty workable and moderately impressive shots. Additionally, there are some other important bits of information covered in that tutorial, including such considerations as choosing an appropriate location and time of year, so if you’re not already familiar with that, you’ll want to be sure to check it out. This tutorial is designed for use with slightly nicer gear, although not that much nicer, because I’m still a broke student rocking a 7-year-old Canon 30D. Joe asked me if we could sell the 30D to make some money to go toward our next camera, to which I began to laugh hysterically. Our 30D has seen better days; the capacitor on the shutter button is fried, so you can’t use it to take pictures. Instead, I spent $20 on a remote shutter release in order to bypass the capacitor issue and voila, it works. But a quick search on eBay showed that used Canon 30Ds in immaculate condition are going for between $150-$250. I’m pretty sure I couldn’t give ours away. But anyway, I still used the 30D for this galaxy shoot, and the point in telling you this is to emphasize that for this application, although the camera does make a difference, the lens makes a bigger one. How much of a difference? Well, let’s judge that based on a comparison of two strikingly similar shots I took, one from this year and one from last year. For these two shots, I used the same camera, and took the picture around the same time of year, same time of day. The only real difference is the capabilities of the particular lens I used for each shot. In the older one (bottom), I used the standard 18-55mm f3.5 zoom lens. For the newer one, I used a 24mm f1.4 prime lens. The difference between the resulting pictures is quite striking. The more recent image has dramatically less noise, is better exposed and has much sharper detail. The older one is extremely noisy, has significant color banding, is not crisp and is very underexposed. The Milky Way shines in the newer one and is just kind of ‘meh’ in the older one. The primary differences between these two lenses come down to two important things: the quality of the optics, and the aperture. The aperture refers to the “speed” of the lens, in other words, how fast a lens lets light into the camera. The lower the f value on a lens, the faster it is. An aperture of f3.5, which I used in the older picture is okayish in terms of speed, but not really ideal for low-light situations, which are a hallmark of astrophotography. The newer photo was taken at an aperture of f1.4, which is much faster and ideal for low light situations. The result is that, even with a shorter exposure, the faster lens let in loads more light. This meant that I did not have to manually lighten the exposure in Photoshop, which meant that I wasn’t forced to introduce a ton of extra noise into the shot in order to get a workable exposure. 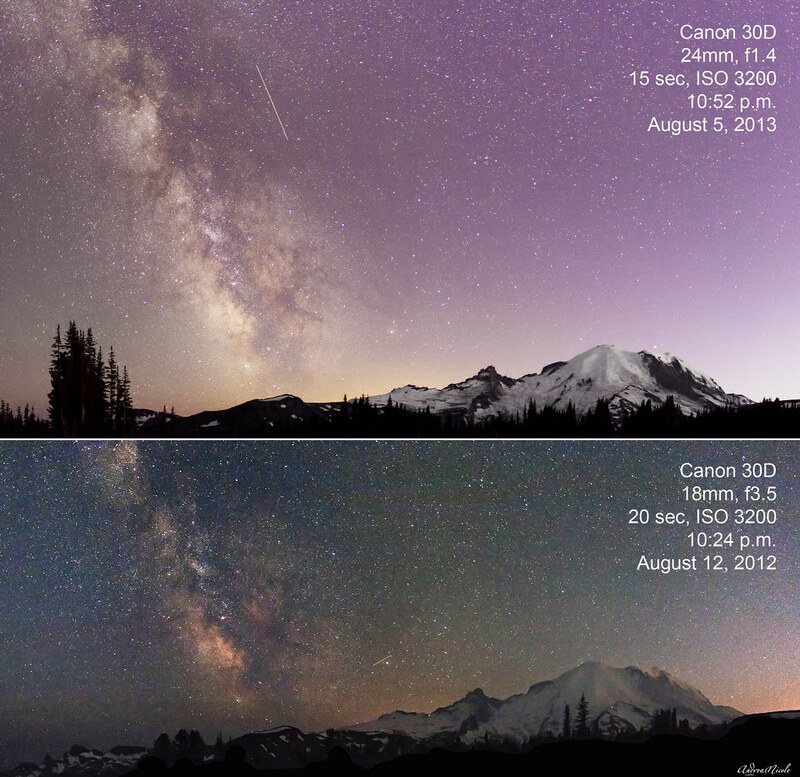 Generally, for wide field astrophotography, you want to use the fastest lens (lowest f value) you can. Ideally, had this shot been taken with a camera containing a full frame sensor, I could have reduced the ISO below 3200 and taken a longer exposure, which would have reduced the noise even further. Why is that? This is covered in the other tutorial, but it is so important to getting a good shot, that I’m going to briefly cover it again here. As the earth rotates, the stars appear to move across the sky. Well, the earth actually rotates rather quickly meaning that the stars race across the sky rather quickly as well. So much so, that very often an exposure of only 30 seconds in length will be long enough that the stars will have moved noticeably and you will end up with star trails, meaning your stars will not be pinpoints of light, but rather blurry, oblong things. So how do you choose the correct exposure? Exposure is determined by a couple of different factors, both affecting how much “space” any given star takes up on your image sensor. The smaller a star appears on your image sensor, the longer an exposure you can get away with before it begins to produce a trail. The two factors that determine how large or small a star is on your image sensor are the focal length of your lens and the size of your sensor. Many DSLRs have cropped sensors, meaning they are not full 35mm sensor, but they are cropped by some factor (e.g. the 30D has a 1.6x crop). This causes images to take up more space on the sensor, because the sensor is smaller. Focal length also contributes to how large something appears on an image sensor, so the longer the focal length, the larger the image appears on the sensor. Example: The 30D is a cropped sensor, and I was using a 24mm lens, so 300/24=12.5 seconds. Because I like to live dangerously, I exposed my photos at 15 seconds and this worked well, but exposures that were taken up to 20 seconds did result in very noticeable star trails. Example: Had I been shooting on something with a full frame sensor, the stars would have taken up less space on the sensor, so with the same 24mm lens, my calculation would have been 600/24=25 seconds. I have however seen people successfully push the exposure with this combination up to 30 seconds before they start getting star trails. These formulas are intended to provide a ballpark estimate of how long you can get away with. As you can see, the full frame sensor allows for an additional 10 seconds of exposure, which means that you can significantly reduce your ISO, resulting in a better picture with less noise. 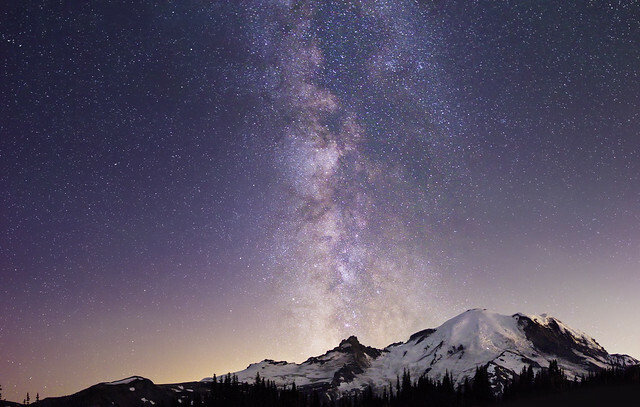 In wide field astrophotography, you are attempting to capture… a wide field. So it makes sense that you’ll want to have a lens that is capable of capturing a wide field of view. Again, we get into the differences between the cropped and full frame sensors, because the apparent focal length of a lens is determined by the size of the sensor. For example, on a camera with a 1.6x crop, such as the 30D, the 18mm lens has an apparent focal length of approximately 29mm. The apparent focal length of a lens on a cropped sensor can be determined by multiplying the crop factor by the focal length of the lens, in this case 1.6 x 18mm = 28.8mm. For the pictures above, I was shooting at 24mm focal length with a 1.6x cropped sensor, so my apparent focal length was actually 38.4mm, which is not ideal for getting the entire scene. So how did I get the entire field of view? This is workable to a degree, by taking a series of images of the scene and then stitching them together with my favorite panorama stitcher, Hugin. However, while it is possible to improvise a bit if you’re working with a cropped sensor, I would still not recommend using a lens with a true (not apparent) focal length greater than 24mm on any size sensor. Focusing your lens in the field when there is only faint starlight is going to be next to impossible for many types of lenses. My first time out shooting with my 18mm lens last year resulted in many blurry pictures because the focus was just so difficult to pin down. My recommendation would be to focus your lens to infinity in the daylight, which can be done by pointing your lens at an object that is roughly 100+ feet away and focusing on it. Then switch that sucker to manual focus and don’t touch it. I might even go as far as to tape the focusing ring in place to prevent “drift”. Some lenses, including the Canon EF 24mm f1.4L lens have indicators on the top of the lens that show when the lens is focused to infinity. This makes focusing in the field much, much easier.